People often don’t understand what it means when I say we need to “Restore Representation” and I think this is a good time for me to give a simple and short explanation. A direct democracy where each citizen represents themselves in the legislature is not practical (though no one in a direct democracy complains about their representative) We have a form of Government, a republic, in which we delegate the decision-making to a group of elected representatives. Most of the legislative power is handed to those we elect to be our representatives whether it’s in Congress, state legislatures, or local governing bodies. We charge our representatives to advocate for our interests. The most important and overlooked aspect of representative government is how many people each representative has in their district. A representative is supposed to be an agent of the people they represent. When the districts get too big, their lone representative is unable to serve everyone and almost certain to neglect the interests of certain demographics. I have updated one of my charts to show the issue clearly. It shows the lower chambers of each state and illustrates the differences between district sizes in the states. Now the problem is not just the difference between the states although it is eye-opening. The bigger problem is, we tend to leave the number of Representatives the same even as the population grows. This makes the districts even larger and dilutes the voice of the common citizen even further. This chart shows how district size swells over time. The Assembly districts in California began with one representative for about every 2,500 and today, there is one representative for almost 500,000 citizens. 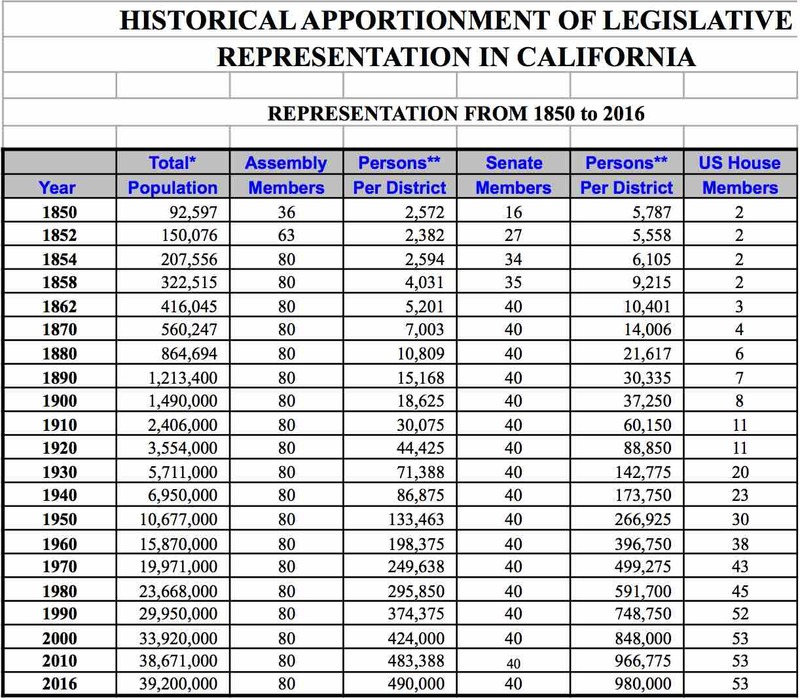 We can see that representation in the California Assembly was historically increased to keep districts at 2,500 people. But after some time, representation was never increased again. This is a problem and we have to be honest that no one person can possibly represent half a million people. Between 1776 and 1787 (between the signing of the Declaration of Independence and the signing of the US Constitution,) lower chamber district sizes were between 900 people at the smallest to about 6,000 for the largest. This last chart shows how small the districts of the states were in the founding era which is between 1776 and 1787 (between the signing of the Declaration of Independence and the signing of the US Constitution). Lower chamber districts in most states were very small, especially compared to today. The district sizes at that time were between 900 people at the smallest to about 6,000 for the largest. The Founders noted that when it came to the U.S. House of Representatives, that they believed a district size of 30,000 was proper and 40,000 was too big. 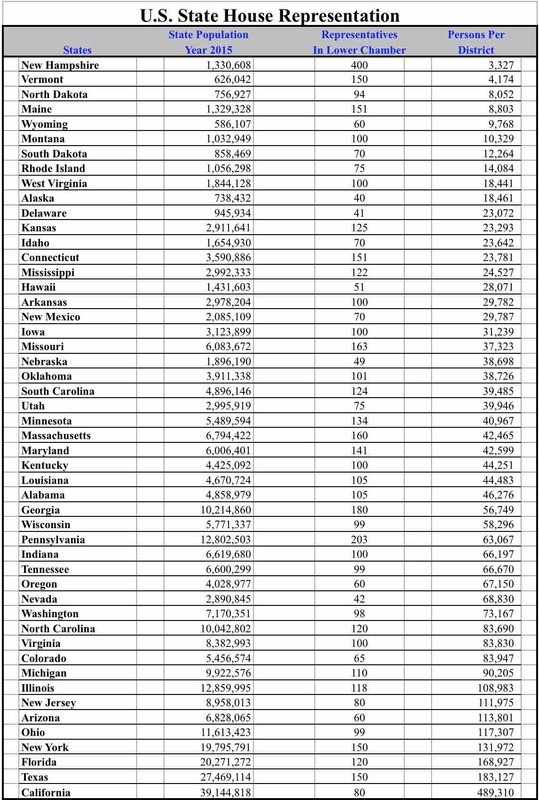 Yet we can see in the first chart that 40,000 is now the median representation for state level representation. We elect representatives to advance our interests, but when representation becomes too sparse as it is, we get the problems that our country is facing today and they will not be fixed until we properly increase and thereby “Restore Representation”! Please stay with us!